There are loads of great travel quotes, but one of my favorites is from Antonio Machado, a popular Spanish poet: “Traveler, there is no path, paths are made by walking.” It’s got just the right mix of mystery, mysticism, and expansiveness to be profound, but enough authority and simplicity to be a bumper sticker. Here in New England, we’ve got a small amount of square footage, relatively speaking. Roughly 70,000 square miles, compared to Texas at 268,820 (we could still take them), but it’s jam-crammed with attractions, and we’ve got the travel guides to prove it. Fodor’s, Frommers, and Lonely Planet. Best restaurants, B&Bs, family destinations, and pet-friendly pit stops. Walking, biking, hiking, beaches—it’s all part of our package. But one of the things that makes NE so great is its weird personality. You think “New England” and there’s an actual visual that comes to mind, for me, anyway. An oddball eccentric who says, “Roads be damned—who needs roads. I’m finding my own path.” A mix of Machado and Robert Frost. 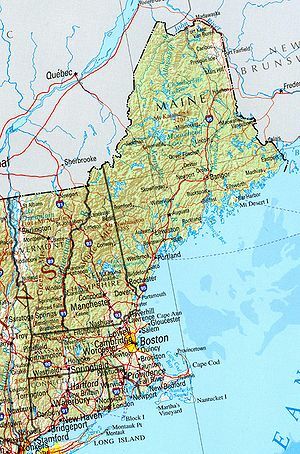 I’m a native New Englander, and my job as a freelance travel writer takes me all over the six states, from the top of Maine to the tip of Connecticut, working diagonally, in a zig-zag through NH, Vermont, Massachusetts, and Rhode Island. There’s an eccentric, weird, fun, unexpected New England out there, and I’d like to start sharing it, blog by blog. Don’t believe me? Let’s take a walk. This entry was posted in A Desk with a View, Travel and tagged Antonio Machado, Connecticut, Maine, New England, New Hampshire, Rhode Island, Robert Frost, Vermont. Bookmark the permalink. Should you ever need a driver, let me know.